Robert Krulwich, an NPR correspondent who maintains his own "sciencey" blog on the organization's website, may have helped to bring attention to the first photograph of a human being ever taken thanks to his interaction with readers. 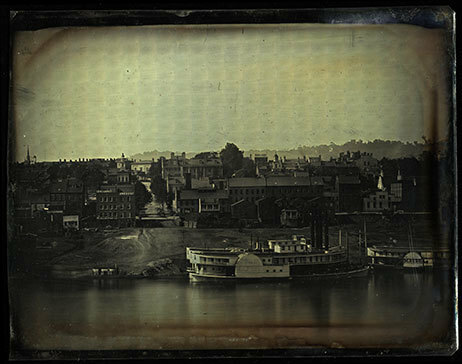 In September, Krulwich posted a set of daguerreotypes taken by Charles Fontayne and William Porter in Cincinnati 162 years ago, on September 24, 1848. Krulwich was celebrating the work of the George Eastman House in association with the Public Library of Cincinnati and Hamilton County. Using visible-light microscopy, the George Eastman House scanned several plates depicting the Cincinnati Waterfront so that scholars could zoom in and study the never-before-seen details. I have lightened it up a bit and messed with the contrast a little, and I think the man on the left is standing behind the wooden beam wall (wharf? dock?) with his left leg up on the wall and his left hand resting on his knee, while the man on the right is standing on top of that wall. What do you think? Impressed by his observations, Krulwich visited Hokumburg's own blog, the Hokumburg Goombah, where he came across a photograph taken almost a decade earlier. The photo, shown below, was taken by the inventor of the Daguerreotype himself, Louis Daguerre, on the streets of Paris in 1838. Hokumburg claims, in his post, that this is the first photograph of a human being. The image, haunting in its absence of, well, life, reminds me of Abelardo Morell's long-exposure digital photographs, a modern-day play on old technology. One of the first photographic processes, the daguerreotype required very long exposures to form an image on the surface of a silver plate. It's likely that this was a busy street at the time, but because the image would have taken several minutes to form, only the figure standing still -- getting his boots shined? -- shows up.